The Nolcha Shows at New York Fashion Week just celebrated their 10th Anniversary at NYFW by wrapping the Spring/Summer 2018 season at Industria Studios, featuring 7 runway shows. The platform for indie brands remains the go-to downtown destination for discovering fresh designs during fashion week. This season saw a number of key fashion bloggers & digital influencers attend the show as Nolcha Influencer Ambassadors including:Carolina Fryer, Michelle Sullivan, Scarlem Mateo, Urszula Makowska, and Maritza Pena. YouCam Makeup App was also on hand to create a unique runway beauty experience. Beauty lovers had the chance to experience the runway show makeup looks through true-to-life in-app makeup trials with YouCam’s patented augmented reality technology. The day kicked off with the “All Comes From Nothing” show at 1pm from designer Eva Yiwel Xu, which was inspired by the Chinese philosophy of simplicity and minimalism. 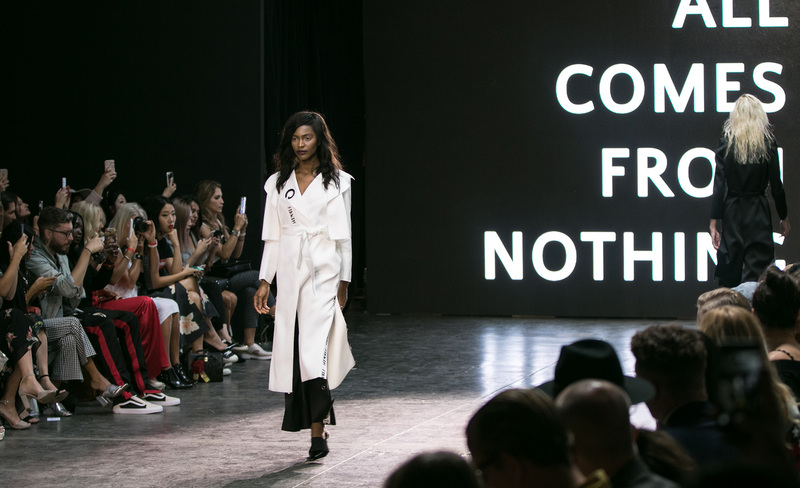 The show was filled with minimalist designs and a sleek color palette. The “W. Reflex” show from designer Kris Wu followed at 4:30pm and showcased a collection of men’s and womenswear. The show was the brand’s worldwide debut with modern silhouettes using raw materials like cotton, linen and leather to tell a story inspired by NYC loft culture. Always a fan favorite, the “Luyang by Yanglu” show from designer Yang Lu followed at 6pm, showcasing a collection inspired by the act of falling in love, with the color red playing a prominent role in many of the designs. The collection featured intricate folds, embroidery, printing, and hanging ribbons, all to emphasize love in its many forms. The 8:30pm “Main Runway Show” closed the day and featured brands including: TRADE by Gina La Morte (a women’s handbag and apparel line for a cause, supporting the work to end the violence & trafficking of women and children), Yurita Puji (Indonesian womenswear collection highlighting traditional ikat woven fabrics ), Neubyrne (a fun, vibrant womenswear collection with inspiration drawn from the designer’s travels around the globe), and Chasity Sereal (a women’s evening wear & non-traditional bridal collection). Celebrities who came out to support independent fashion design included: Bellsaint (Singer/Songwriter), Kenneth Faried (Basketball Player, Denver Nuggets)Alicia Wright (MTV’s Are You The One), Ayden Hernandez (Actor,) Zeke Thomas (DJ/Producer), Geri-Nikol (Recording Artist), Ally Ryan (Recording Artist), and Derek Warburton (Celebrity Stylist). Official Sponsors of the Nolcha Shows included: Youcam, AOFM, Barton Sculptures, CitiBank, UPS, and ECRU New York. For more information or designer profiles, visit:www.nolchashows.com.